On December 15, 1998, Frontera Resources Corporation signed a contract with SOCAR for the exploration and development of the Kursangi-Garabaghli Block. Photo: The Signing Ceremony for the development of Kursangi and Garabaghli onshored fields on on December 15, 1998. Standing: Bill White, (President of Frontera Resources). He is flanked by Ilham Aliyev (SOCAR VP) on the left and Natig Aliyev (SOCAR President) on the right. Amerada Hess is also a partner in this project. The agreement heralds one of the first onshore rehabilitation, development and exploration projects in Azerbaijan to be conducted under a production-sharing agreement. Currently the fields are producing a combined total of approximately 4,200 barrels of oil daily. The Kursangi-Garabaghli Block is located 100 km southwest of Baku. The production sharing agreement covers a block of approximately 116,000 acres and is shared between Frontera (30%), Delta Hess (20%) and SOCAR (50%). Amerada Hess Corporation and Delta Oil Central Asia Ltd formed Delta Hess in order to hold a joint interest in the block. Salyan Oil Ltd is the operator. The contract was signed in SOCAR's Baku offices between SOCAR President Natig Aliyev and Frontera's Chairman of the Board William White and President and Chief Executive Officer Steve C. Nicandros. 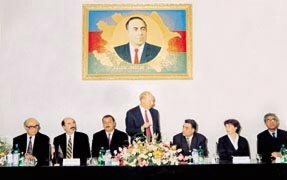 Preliminary documents of the contract had been signed on June 2, 1998 at the opening ceremony of the 98 Caspian Oil and Gas Exhibition. Total capital expenditures in the range of $870 million are anticipated over the life of the contract. Frontera anticipates assuming operations within the block in early 1999, following ratification of the contract by Azerbaijan's parliament. Plans include rehabilitation work aimed at doubling the block's current production as well as seismic programs and other technical studies that will lay the groundwork for development and exploration projects. Frontera estimates that the block holds 1.4 billion barrels of oil. Frontera is a privately held international energy company based in Houston, Texas and is engaged in development projects in Azerbaijan, Georgia and Bolivia. The company has worked in close partnership with Azerbaijan for more than two years to analyze the potential of the Kursangi-Garabagli Block and to develop a joint vision for its future.